In addition to laser procedures, many resurfacing methods are available, including botox injections, chemical peels, injectible fillers, and surgical procedures (e.g. facelift, browlift, blepharoplasty). Individuals looking to rejuvenate their skin should consider factors such as the ease, effectiveness, and safety of the procedure; post-procedural effects; potential for complications; length of recovery; and duration of benefits. A patient’s age may also be a useful general guideline for choosing skin procedures. Some physicians recommend chemical peels for patients in their thirties, collagen or fat implants for patients over age 40, and laser resurfacing after age 50. Patients with light skin color represent the best candidates for laser skin resurfacing. Those with dark skin pigmentation may experience hyperpigmentation or depigmentation of their natural skin color after laser resurfacing. Some experts also find combinations of procedures to be useful among older patients. For example, a patient might use laser surgery for deep lines around the mouth and chemical peels on the rest of the face. 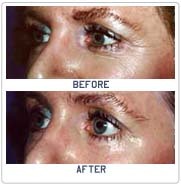 A combination of blepharoplasty (eye lift) and laser resurfacing might be used to rejuvenate the eye area. Injecting wrinkles with botox before performing laser resurfacing of crow’s feet can significantly improve results there. In about 1% of patients, scarring and infections may occur. The surgeon’s experience is the main factor in determining likelihood of these complications. In darker-skinned patients, unpredictable lightening of the skin can be a troublesome effect. Patients with herpes simplex may experience flare-ups of fever, facial pain, and flu-like symptoms following the procedure. The long-term effects on the skin are not yet known. Your surgeon will ask you about your medical history, drug allergies, and check for conditions that could cause problems, such as active skin infections or non-healed sores from injuries. Collagen injections are generally off limits for pregnant women, individuals who are allergic to beef or bovine products, patients who suffer from autoimmune diseases, and those who are allergic to lidocaine (the anesthetic agent contained in the syringe with the collagen material). For more specific information about the contraindications and risks of collagen use, ask your doctor for the manufacturer's brochure for patients. Laser pulses target the surface layer of the skin, vaporizing water and the skin’s surface without affecting deeper layers. A new surface layer will then grow back – a layer that is soft, wrinkle-free, and younger looking. The heat generated during the process also shortens the collagen fibers in the skin, which restores some of its elasticity. Different types of lasers are available. They vary according to their wavelength and pulse duration. These differences account for the depth at which they target the skin, the level of heat generated, and the likelihood of affecting surrounding tissues. Carbon Dioxide (CO2) lasers – the most powerful laser, used for deep wrinkles. Note: CO2 lasers may be unsafe for people who have had silicone injections, as the laser can burn and scar the skin over implanted areas. Erbium:YAG (Er:YAG) laser - gentler than the CO2 laser and effective for mild wrinkles. It targets tissue more precisely than the CO2 laser and causes less damage to surrounding tissue. Recovery after Er:YAG laser treatment is shorter than that after CO2 laser treatment. When used at sufficient depth, some surgeons can remove deep wrinkles with the CO2as effectively as the more powerful CO2 laser, but with fewer side effects. The Variable Pulse YAG laser alternates between pulses that destroy tissue with pulses that heat the skin, and this process also resurfaces the skin as effectively as CO2 but with fewer side effects. A combination of CO2 and Er:YAG laser treatments is now gaining popularity. In this treatment, the Er:YAG laser is first used to remove the epidermis, followed by use of the CO2 laser to achieve contraction of underlying collagen. This produces the collagen-tightening benefits of CO2 therapy but with minimal damage to surrounding tissues. 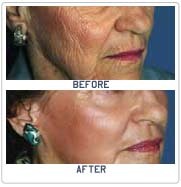 NLite – Non-ablative laser resurfacing, also called Photorejuvenation, uses light energy to stimulate the new growth of collagen without removing skin tissue. While it is less powerful at removing wrinkles than other resurfacing methods, it may be used for delicate areas such as the eyes and neck, and causes little irritation. While the laser procedure is itself virtually painless, post-procedure redness and irritation can be severe. The face looks skinned, swollen and may become crusty during the first ten days; redness, itching and sensitivity may last up to four months. Patients must stay out of the sun during healing, and after recovery, always avoid sunbathing. Oral antibiotics and analgesics are routinely prescribed, and in some cases anti-inflammatory medications may be used as well. Dressings are used to keep the skin moist during the first two weeks. Depending on the type of dressing used, more or less oozing and crusting may be expected. After the dressings are removed, patients need to apply moisturizers for another 2 – 3 weeks. A gentler laser skin rejuvenation treatment may reduce the appearance of some imperfections and may require little or no downtime. Consult a dermatologist to determine the most appropriate treatment as well as a case-specific estimate of healing time and likely results. Cosmetic laser skin resurfacing treatments can help reduce the effects that sun exposure, aging, and acne has on the skin in order to reveal a healthier, younger-looking complexion. Laser peel procedures are also surprisingly cost effective. << Back to "Cosmetic Surgery "
Laser Skin Resurfacing SurgeryIndia, Cost Laser Skin Resurfacing Surgery,Laser Skin Resurfacing Surgery India, Low Cost Laser Skin Resurfacing Surgery Delhi India, Laser Skin Resurfacing Surgery Hospital Delhi, Laser Skin Resurfacing Surgery Mumbai Hospital, Cost Laser Skin Resurfacing Surgery Mumbai, Delhi-India, Low Cost Laser Skin Resurfacing Surgery Hospital, Affordable Laser Skin Resurfacing Surgery Hospital Mumbai, Delhi, Cost Laser Skin Resurfacing SurgeryHospital Delhi.